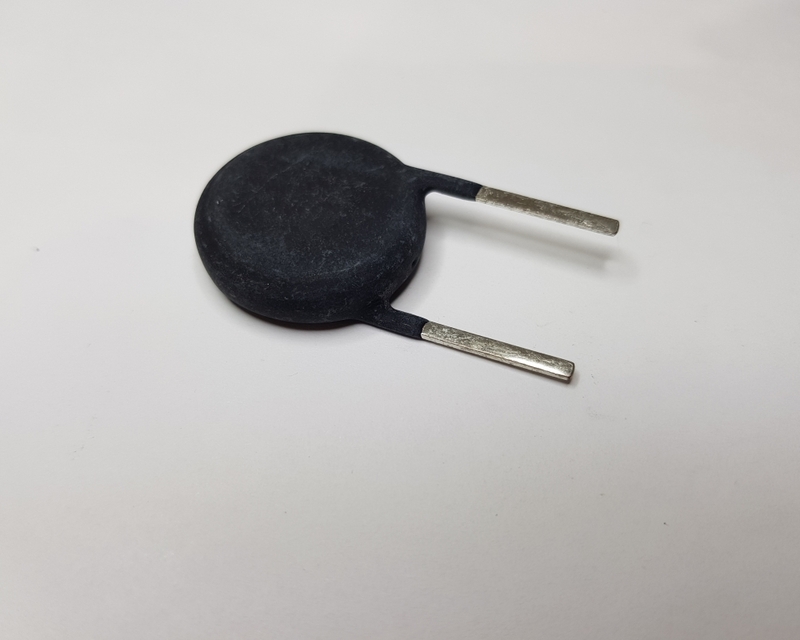 Additional Features Inrush current limiting thermistor, suitable for high energy and short term high current applications. 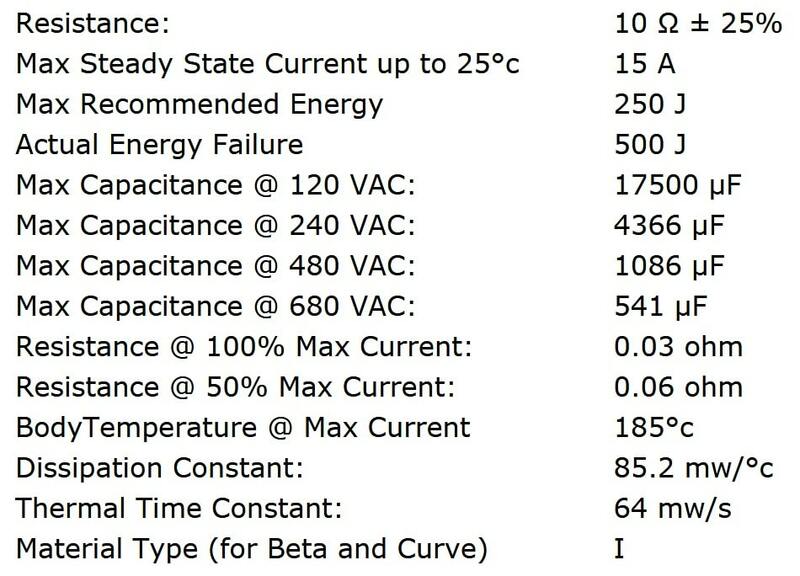 Dissipation constant 85.2mW/°C. Thermal time constant 64mW/s. Material type I (for beta and curve). Recognised by Underwriters Laboratories (UL) for ensured safety. The AS32 0R530 inrush current limiting thermistor from Ametherm offers a maximum steady state current of 30A (up to +25°C) and a resistance of 0.5Ω ±25% (at 25°C). The Ametherm AS series are designed to withstand high steady-state current and input energy. Compared to traditional inrush current limiters, the devices offer lower current density, faster reset times, and a wider temperature range without derating. This lower current density, in co.. The AS32 0R536 inrush current limiting thermistor from Ametherm offers a maximum steady state current of 36A (up to +25°C) and a resistance of 0.5Ω ±25% (at 25°C). The Ametherm AS series are designed to withstand high steady-state current and input energy. Compared to traditional inrush current limiters, the devices offer lower current density, faster reset times, and a wider temperature range without derating. This lower current density, in co.. The AS32 1R030 inrush current limiting thermistor from Ametherm offers a maximum steady state current of 30A (up to +25°C) and a resistance of 1Ω ±25% (at 25°C). The Ametherm AS series are designed to withstand high steady-state current and input energy. Compared to traditional inrush current limiters, the devices offer lower current density, faster reset times, and a wider temperature range without derating. This lower current density, in comb.. The AS32 1R036 inrush current limiting thermistor from Ametherm offers a maximum steady state current of 36A (up to +25°C) and a resistance of 1Ω ±25% (at 25°C). The Ametherm AS series are designed to withstand high steady-state current and input energy. Compared to traditional inrush current limiters, the devices offer lower current density, faster reset times, and a wider temperature range without derating. This lower current density, in comb.. The AS32 2R025 inrush current limiting thermistor from Ametherm offers a maximum steady state current of 25A (up to +25°C) and a resistance of 2Ω ±25% (at 25°C). The Ametherm AS series are designed to withstand high steady-state current and input energy. Compared to traditional inrush current limiters, the devices offer lower current density, faster reset times, and a wider temperature range without derating. This lower current density, in comb.. The AS32 5R020 inrush current limiting thermistor from Ametherm offers a maximum steady state current of 20A (up to +25°C) and a resistance of 5Ω ±25% (at 25°C). The Ametherm AS series are designed to withstand high steady-state current and input energy. Compared to traditional inrush current limiters, the devices offer lower current density, faster reset times, and a wider temperature range without derating. This lower current density, in comb.. 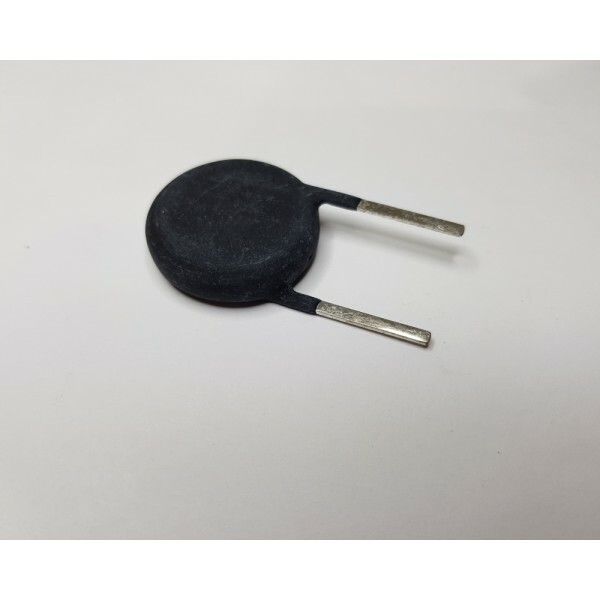 The AS32 20010 inrush current limiting thermistor from Ametherm offers a maximum steady state current of 10A (up to +25°C) and a resistance of 20Ω ±25% (at 25°C). The Ametherm AS series are designed to withstand high steady-state current and input energy. Compared to traditional inrush current limiters, the devices offer lower current density, faster reset times, and a wider temperature range without derating. This lower current density, in com.. 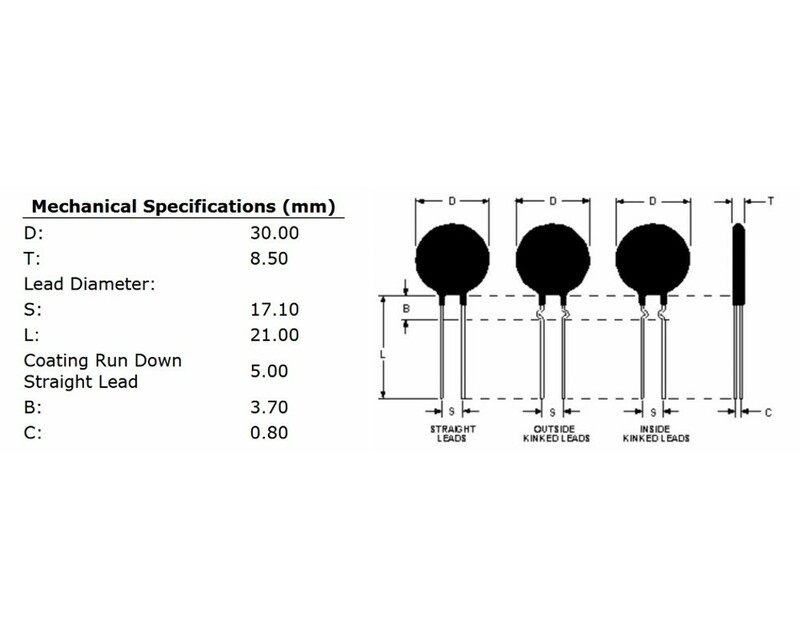 The AS32 50006 inrush current limiting thermistor from Ametherm offers a maximum steady state current of 6A (up to +25°C) and a resistance of 50Ω ±25% (at 25°C). The Ametherm AS series are designed to withstand high steady-state current and input energy. Compared to traditional inrush current limiters, the devices offer lower current density, faster reset times, and a wider temperature range without derating. This lower current density, in comb..